Take a moment to think about what connects the thrust created by your vessel’s propeller to the vessel itself. Its very driving force. 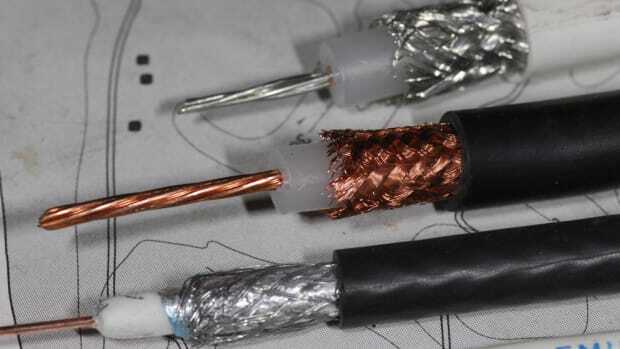 These small, simple components bear a heavy burden, so treat them right. 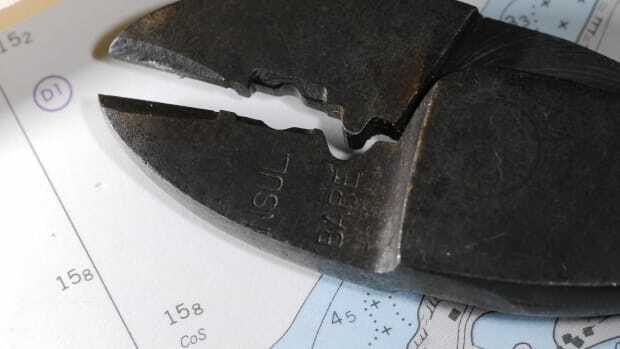 Take a moment to think about what connects the thrust created by your vessel’s propeller to the vessel itself. Its very driving force. The propeller shaft, transmission and engine are all isolated from the hull by four small components. Motor mounts are the sole means of interface between the power created by the engine and the vessel, enabling it to move. If they are improperly installed or ill-maintained, you may not be able to rely on them to do their job. The motor mount’s saving grace is its simplicity; it typically has only two moving parts, the adjustment and locking nuts that enable it to be used as a fine tuner(coarse adjustment is carried out during initial engine installation and with shims where necessary) of engine alignment. A typical motor mount consists of a cast or forged aluminum or steel foot, which is affixed to the vessel’s hull or stringers. Within this base or foot is a rubber-like, vibration-absorbing pad or ring, some of which are considerably more sophisticated than others. The threaded stud rests on top of or within the rubber, offering it a degree of isolation from the metal base and the stringer. Motor mounts have two vital missions. First, they should be designed to absorb some of the vibration created by the engine and running gear. Second, with the exception of vessels that are equipped with a thrust bearing system, motor mounts must also absorb the aforementioned thrust created by the propeller. Carrying out both of these tasks well is a tall order. Absorbing vibration requires suppleness in a motor mount’s flexible component, however, absorbing thrust invariably compresses a portion of that flexible material, thereby enabling the transmission of vibration. Additionally, resistance from the propeller under load causes an engine to attempt to rotate in the opposite direction, thereby compressing the mounts on one side of the engine more than the other. In some cases, for smaller engines, the mounts on the non-compressed side may actually go into tension. That is, they are being lifted by the engine. For this reason, some engine manufacturers specify mounts of differing durometer for the right versus left sides of the engine, a detail that is critical for those carrying out mount replacement. Washers used with all motor mount hardware must be resistant to distortion. Motor mounts are available in a wide range of sizes and durometer, and with varying mechanisms, improving their ability to absorb both vibration and thrust. Most are exceedingly simple, relying on a cast-in-place hunk of rubber to fulfill these roles. Others are more complex, and more costly, with designs that allow progressive absorption of movement and compression that’s based on thrust load. More sophisticated mounts also typically require specialized knowledge where installation and adjustment are concerned. One brand, Barry Controls, includes a two-page installation “manual.” Reading it is a must for every installation and subsequent adjustment. In the vast majority of cases when I encounter these mounts, I’m able to determine with a quick visual inspection that their installation instructions have not been followed, or they have not been adjusted properly. I happen to like these mounts, I believe they are very effective, however, if they are not installed properly then you’ve paid for performance you aren’t getting. In addition to ensuring that the engine remains firmly attached to the vessel in which it’s installed, the motor mounts perform another vital function; that of engine alignment or adjustment. Rotating the adjustment nut on the mount stud enables a mechanic or savvy do-it-yourselfer to move any one of the engine’s four corners up or down as necessary in order to properly align the shaft coupling with the transmission output coupling. Once the alignment is set, it rarely has to be adjusted, and herein lies the problem. 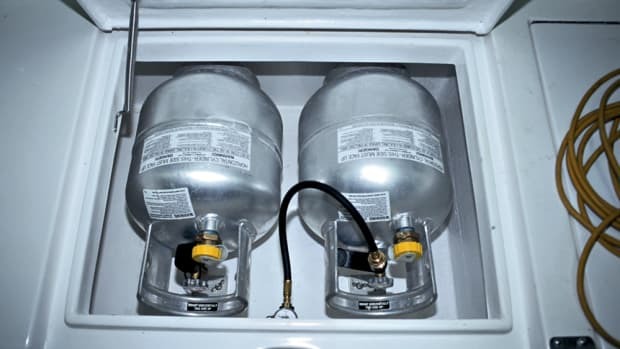 With disuse, any mechanical component can become balky and motor mounts are no exception. You may find, when the day comes where the engine alignment must be adjusted, the mounts are frozen solid with years of accumulated corrosion. Inspect your mounts for rust, make sure they are free of rust and corrosion, and then spray them liberally with a non-petroleum-based corrosion inhibitor to keep rust at bay. Petroleum-based lubricants and rust preventatives may attack the mount’s rubber shock absorber, so avoid them or use with caution, avoiding application onto the flexible component. More sophisticated mounts include two stages of adjustment. One involves alignment, the other has an effect on the amount of load carried by the mount. 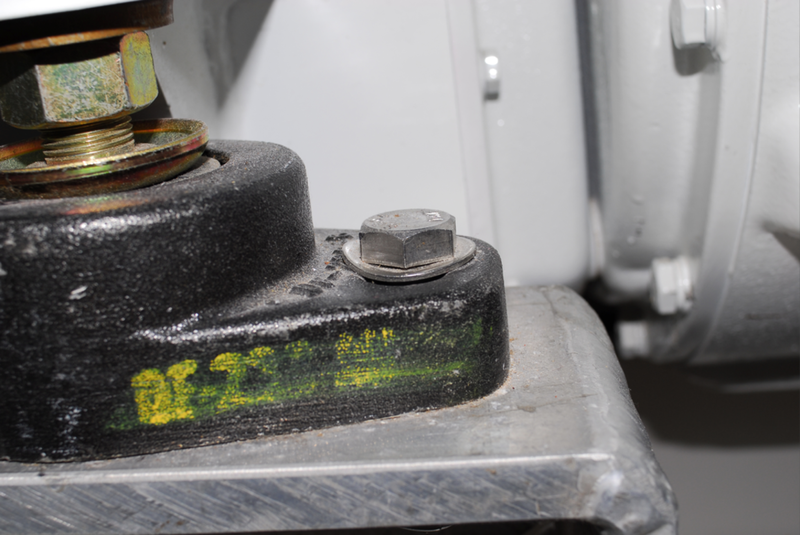 Unevenly loaded mounts can actually induce rather than mitigate vibration. Where conventional mounts are concerned load is difficult to determine. For “designer” mounts, on the other hand, a load indicator is incorporated into the mount’s design, enabling an installer to, in addition to carrying out alignment, properly balance load across all four mounts, a desirable feature to be sure. 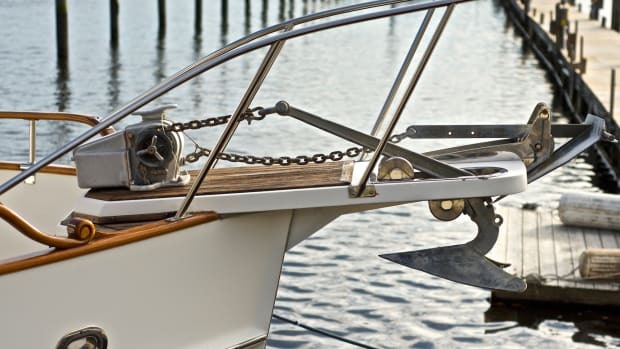 Check all mount fasteners—those used for adjustment as well as those that attach the mount base to the vessel’s stringers, and the mount bracket to the engine or transmission. For casual inspection simply run your fingers over all of these and feel for any movement. 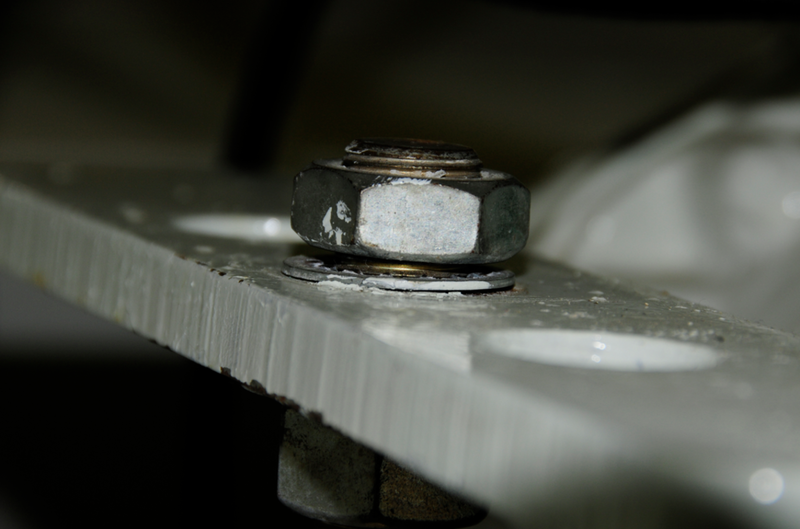 Mount fasteners are notorious for loosening, deforming, rusting and stripped threads. Inspect the visible portions of rubber shock-absorbing material on your mounts. If they show any signs of cracking, crumbling or separating from the metal, it’s time (probably well past time) for their replacement. 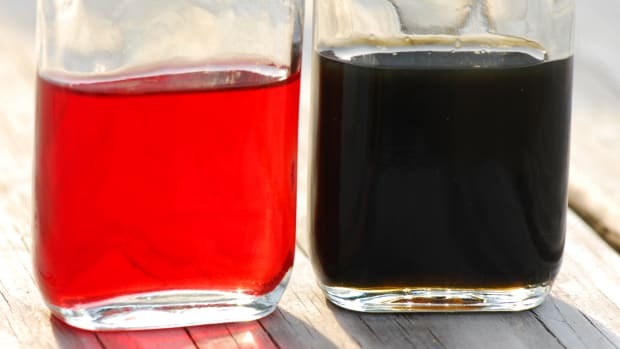 Some higher quality mounts utilize a color indicator to draw attention to failing flexible material, the outside portion is black while the core is red. If you see the latter then the mount has effectively failed, frequently because of improper installation. Loose motor mount locking nuts are especially common. Avoid using star (shown above), or split lock washers, instead rely on self- locking nuts or cam-style washers. Engine brackets should interface with motor mount studs at the midway point or lower, however room should remain to adjust downward if necessary. All engine brackets should be at roughly the same mount stud position, shims installed under mount bases should be used if necessary, to close an excessive gap. Self-locking or double adjustment nuts should be used, along with hardened, “thick” washers (thicker than typical fender washers), both above and below the engine bracket. Unlike conventional thin washers these are able to resist deformation under the very heavy loads to which motor mount hardware is subject. Because many mounts include an athwartship adjustment slot, fasteners that secure mounts to stringers should also be equipped with heavy duty, deformation-resistant washers. Any deformation in motor mount washers is too much. Look carefully at yours and upgrade them if necessary. 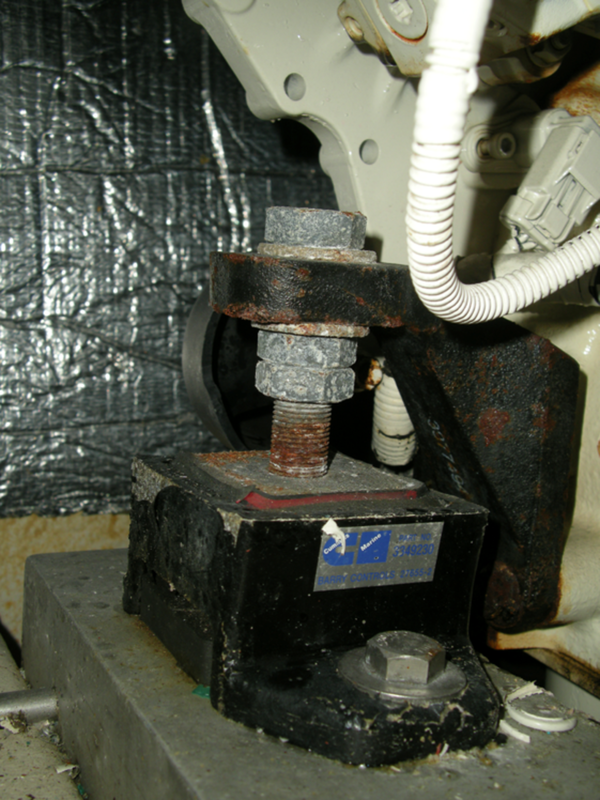 Make sure all fasteners associated with motor mounts are installed over surfaces that are free of paint. 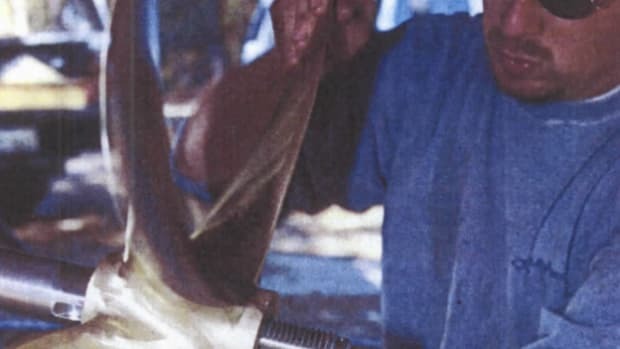 Under heavy compression paint can crack or be squeezed out from under fasteners over time, leading to loss of tension. Finally, use a torque wrench to tension all motor mount fasteners, including and especially the upper adjustment locking nut. Steve owns and operates Steve D’Antonio Marine Consulting, Inc. (www.stevedmarineconsulting.com), providing consulting services to boat buyers, owners and the marine industry.